The Huion H610 Pro is a drawing Tablet that has a roomy 6×10 inch drawing surface and offers excellent quality at very reasonable cost. The features and the quality of this drawing tablet are comparable to some of the lower end Wacom Tablets. The huion h610 pro is a good tablet However, it is not as sophisticated as some of the nicer and more expensive wacom tablets. You cannot draw directly on the screen with this drawing tablet. The huion 610 connects to your pc or mac via a usb cable. the h610 and the h610 pro both have 8 user programmable hot keys that are close to the drawing surface, which is convenient. The tablet will work with wireless mice and keyboards both. Easy to transport, just toss it into your carrying bag along with the USB cables and accessories. Made of hard plastic, it is quite durable. A large compact area for drawing, The large textured surface gives a feel similar to drawing on a real sheet of paper. The 610 Pro has 8 programmable buttons along the edge and 16 hot keys that the user can set to do what they want. A mappable drawing surface allows you to designate the work space and also be set for righty’s and lefty’s alike. Some things to know before hand – this does not come with professional drawing software. This may seem obvious, but I think it is important to share: this is intended to be used with photoshop, illustrator that kind of software. I used this with paintdotnet, and it integrated seamlessly after install. 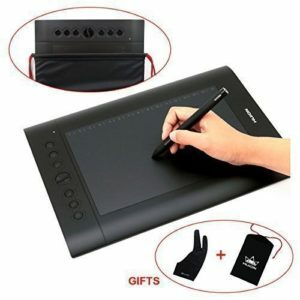 The box includes the tablet, install cd, power cord for tablet (USB), power cord for pen (USB), carrier bag, and glove. The glove is to be used on the drawing hand (whatever hand you use the mouse with). It covers the ring and little finger of that hand, leaving the other two fingers and thumb uncovered. The instructions which come with the install disc are illustrated and provide more than adequate instruction for install, calibration, and use of the tablet. After install, the tablet is plug and play. This setup is as easy as using a mouse. The illustration below took about 20-25 minutes, which includes the learning curve to use the tablet. This is so easy to use. The setup is intuitive with the large buttons on the left-hand side speeding up the drawing process. Where this falls on the tablet spectrum – Amateur to Professional – I’m not 100% sure, but I can say that as a former Engineer that had drafting included in my everyday duties, I wish I had something as useful as this tablet back then. I’m excited to get to use this more and more. I received a discount for this tablet, for a fair and balanced review.